March 30 was a banner day for Tim Pawlenty. The Republican candidate for Minnesota governor hauled in $115,000 in contributions that day, helping solidify him as the clear money leader in the race. It was also the day that nearly 5,000 shares of stock in a frac sand company where he's on the board of directors had vested, meaning he could turn the stock into cash at his discretion. A securities filing valued the restricted Smart Sand shares at $80,000. • Recently: Four gubernatorial candidates discuss competing visions for Minn.
Pawlenty's time at a Washington financial industry trade association — the Financial Services Roundtable — has come up often during his comeback run for Minnesota governor. But that job, which he officially left in March, wasn't the only way he was making a living outside of politics. 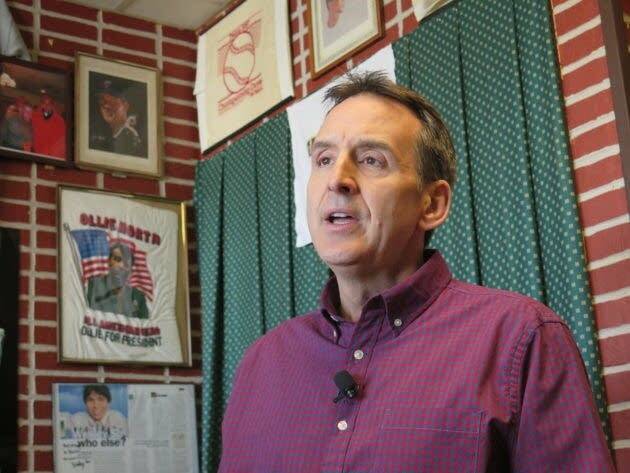 Pawlenty's work on corporate boards hasn't gotten as much attention — and he still serves on some boards. "There's no conflict as a candidate," Pawlenty said this spring. "But if you become governor, obviously I would need to get off those boards." On recently filed state disclosure forms, Pawlenty has reported his connections to the two boards he is continuing to serve on: Texas-based Smart Sand and Eagan-based ConvergeOne, a technology consulting company. There's nothing illegal or even unusual about a former politician ending up on a corporate board. Boston University assistant professor Maxwell Palmer has even studied the trend. His research shows that more than 40 percent of ex-governors have joined at least one corporate board since 1992. In an interview, he said the companies benefit by getting well-connected directors skilled at crafting regulations, writing laws and overseeing executive agencies. For the former governors, there are obvious perks. "They're very well paid both in salary and in stock," Palmer said. "They are positions that are very part-time." The other contenders in the governor's race currently are all elected officials and have declared no present service on corporate boards. DFL endorsed candidate Erin Murphy, a state legislator, lists an outside job as a registered nurse for St. Catherine University in St. Paul. Murphy said Friday that Pawlenty should give up the corporate positions immediately. Federal records show Pawlenty earns $60,000 in fees annually from both Smart Sand and ConvergeOne, plus stock awards. He's accrued hundreds of thousands of shares in the two companies that all told are worth more than $2.5 million based on current stock prices. Over the years, Pawlenty sold thousands of shares at a time, making $180,000 off a single transaction in 2017. He still has stock in two other companies where he's no longer a board member, though those are privately held so details are scarce. Palmer said it's not as common for politicians to serve on corporate boards and then return to public life. But if they do, he said corporate boards are less controversial than straight lobbying. "Lobbying is often seen negatively by voters and by others," Palmer said. "If you're thinking about entering the political arena that doesn't seem to apply to corporate boards, at least to the same degree." In a brief interview shortly after he entered the race, Pawlenty described his board service as an asset rather than a liability. "You learn a ton about gained business and business expansion, jobs, job retention, workforce issues, all sorts of issues," Pawlenty said. "That knowledge is all to the good if you are going to be in government. In fact, I think more government people would be well served to spend some time in the private sector and I wish some of my Democratic opponents would." A more recent request for an interview about his corporate board work was turned down. His work for Smart Sand hasn't gone entirely unnoticed. The company has frac operations in western Wisconsin and moves some sand by rail through Minnesota to oil fields in North Dakota. Company materials note there are also deposits of the sought-after White Northern raw frac sand in the driftless area of southern Minnesota. Johanna Rupprecht, who lives in Lewiston where the frac mining debate has been particularly intense, works with Land Stewardship Action, which has worked to oppose large-scale sand extraction. Rupprecht said she's worried Pawlenty would seek to loosen Minnesota's tough frac mining restrictions and appoint regulators who would ease permitting. "The fact that he's willing to serve on the board of one of those companies indicates that he supports what they're doing, so that's definitely a concern," she said. Pawlenty transitioned to the corporate boardroom not long after he left political office in 2011. He has served on nine boards in all, ranging from technology firms to public safety contractors. Most of the companies are located outside of Minnesota. But one of the first boards he joined is based here and has Pawlenty the governor to thank for some seed financing. In Pawlenty's final State of the State address in 2010, he implored lawmakers to help him rework Minnesota's tax code in the months before he left office. He listed six tax-cut priorities, including an angel development tax credit. Lawmakers came through with the incentive for investors in high-tech startups. An early beneficiary was Eden Prairie-based Miromatrix Medical, a bioengineering company aiming to develop transplantable organs for human use. In 2011 and 2012 combined, Miromatrix investors qualified for nearly $900,000 in angel tax credits, among the most tied to a single company over that span. The company also got loans from the state during Pawlenty's time. About 10 months after finishing as governor, Pawlenty would land on the Miromatrix board of directors. Robert Cohen was president and CEO at the time. He praised Pawlenty's caliber then, but declined an interview request. Former Republican Party Chairman Ron Eibensteiner, a Pawlenty ally then and now, was also a board member. He didn't return a call. Pawlenty's campaign wouldn't discuss precisely how he wound up with the companies he did, including Miromatrix. "Like many individuals in search of employment or work opportunities, he became a board member by either reaching out to or being contacted by people he knew," said campaign spokesman Sam Winter.